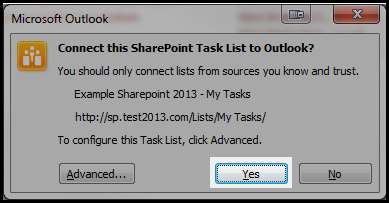 How to integrate SharePoint task list with MS Outlook? People who work a lot with e-mail will find it really convenient to use the SharePoint site tasks lists directly in Outlook, rather than having to switch to the site via the web browser. Once connected, the tasks lists can be viewed and updated; new entries can also be made within Outlook. 2) Go to your Tasks page. 3) Go to List tab and click on Connect to Outlook option. 4) A dialog box will pop up stating that you should only connect lists from sources you know and trust. Click on Yes. 5) In Outlook, the tasks list will show up under Other Tasks in the Tasks section of the Navigation Pane. Sign up for a free task management tool with Cloudappsportal.com.